Saturday, May 21 from 9:00 a.m. until 12:00 p.m. The Friends of American Art and Design of the St. Louis Art Museum invite you to join us for our next program on Saturday, May 21 as we head downtown to explore some of St. Louis’ historic architecture. In 1888, the tallest building in St. Louis wasn’t a skyscraper — it was a sugar refinery. As industry demanded ever taller and larger buildings, technology evolved to accommodate it. Join us as we travel the landscape of downtown St. Louis, tracing the architect’s quest for height and mass throughout the 20th century. We’ll look at warehouses, power plants, industrial sites, and skyscrapers from Louis Sullivan to Philip Johnson. Our bus will depart at 9:00am from the Museum and return by 12:00pm. 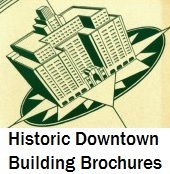 We will be guided by local architectural historians Michael R. Allen and Lynn Josse. We will tour (both by bus and on-foot) some of the city’s notable landmarks. Beverages and a snack will be served. Thank you for your dedication to the arts and patronage to the Museum. Should you have any questions feel free to contact us at 314.655.5390 or members@slam.org. The tour fee is $25.